Coronary Stents Market size was valued at USD 7.6 billion in 2017 and is expected to witness more than 6.5% CAGR from 2018 to 2024. Technological advances in coronary stents providing effective treatment is expected to boost market growth in the foreseeable future. Advances to reduce undesirable effects such as stent thrombosis and in-stent restenosis will foster business growth. For instance, Elixir Medical Corp. developed fully bioresorbable Desolve 100 Novolimus-eluting Bioresorbable Coronary Scaffold System for treatment of coronary artery disease. This product meets specific needs of the patient and is more user friendly. Such advancements will propel coronary stents industry growth during the projected timeframe. Rising prevalence of coronary artery disease will boost market growth during the foreseeable future. Adoption of sedentary lifestyle along with unhealthy diet and alcohol abuse are the major causes of growing incidences of coronary artery disease. According to American Heart Association (AHA), more than 90 million people in U.S. are affected by coronary heart disease. High number of cardiovascular diseases will lead to high adoption rate of coronary stents during percutaneous coronary intervention procedure. Aforementioned factors will spur market growth in the upcoming years. 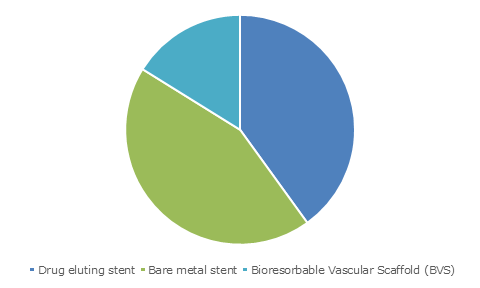 Drug eluting stent market valued USD 3,286.2 million owing to high adoption rate. Prevention of post operation trauma and other complications such as in-stent restenosis and stent thrombosis will spur the demand for drug eluting stents. Wide array of applications including ST segment elevation myocardial infarction (STEMI), percutaneous coronary intervention and diabetes will foster segmental growth. Various technological advances for improving patient outcomes and development of next generation drug eluting stents will spur demand for drug eluting stents in forthcoming years. Bioresorbable vascular scaffold (BVS) market will expand at 7.6% CAGR during the forecast timeframe owing to various technological advances and growing burden of coronary artery disease. According to World Health Organization, more than 31% of the world population die from cardiovascular diseases including coronary artery disease. High pervasiveness of coronary artery disease will drive the need for development of advanced and innovative BVS systems for treatment. Shorter recovery time and low post-operative complication are few of the advantages offered by BVS systems. Such factors will favour segmental growth in recent years. Coronary stent hospitals business accounted for largest revenue of USD 2,584.7 million in 2017. Segmental growth is due to rising number coronary artery disease cases across the globe. Favourable reimbursement policies in most developed countries for cardiac surgeries. Moreover, government policies for implementation of high-quality patient care will attract large number of patients in hospitals to seek treatments. Growing disease burden and increasing healthcare investments will favor segmental growth in the future. Coronary stent use in ambulatory surgical centres will grow with a remarkable rate of 6.1% during the forecast timeframe. The segmental growth is attributable to rising demand for short hospital stays and cost-effective treatments for various cardiovascular disorders. Ability of ambulatory surgical centres to offer single day cardiovascular surgery and lower healthcare-associated costs will favour ambulatory surgical centre segmental growth in the upcoming period. U.S. market contributed to largest revenue of USD 2,331.8 million in North America in 2017. High disposable income and various reimbursement policies will enable patients to opt percutaneous coronary intervention procedures. Growing influence for minimally invasive medical devices will aid in growth of coronary stents business. Moreover, various reimbursement and insurance policies by Center for Medicare and Medicaid (CMS) will foster regional growth in foreseeable years. Indian market is forecasted to expand at a CAGR of 11.9%, owing to various government norms for price control of coronary stents. For instance, in 2018, National Pharmaceutical Pricing Authority (NPPA) of India announced price capping of drug eluting coronary stents. Pricing control will lead to high adoption rate and increasing demand for coronary stents. Increasing healthcare expenditure, favorable government policies and growing per-capita income will contribute to boost industry growth. Few of the notable industry players operating in global market are B. Braun Melsungen AG, Abbott, Biosensors International Group, Boston Scientific Corporation, Biotronik SE & Co. KG, Medtronic plc, Meril Life Sciences, MicroPort Scientific Corporation, Terumo Corporation, and Elixir Medical Corporation. These companies are opting strategies such as novel product launch, mergers and acquisitions to foster business in coronary stents industry. For instance, in May 2017, Medtronic plc announced that it received U.S. FDA approval for launch of its Resolute Onyx Drug-Eluting Stent (DES). This move will enable the company to expand its product portfolio and customer base, thereby strengthening its market presence. Coronary stents have been in use for percutaneous coronary intervention since late 1980’s and numerous upgradations have been done for optimal results. The industry is rapidly growing in both developed as well as developing economies. 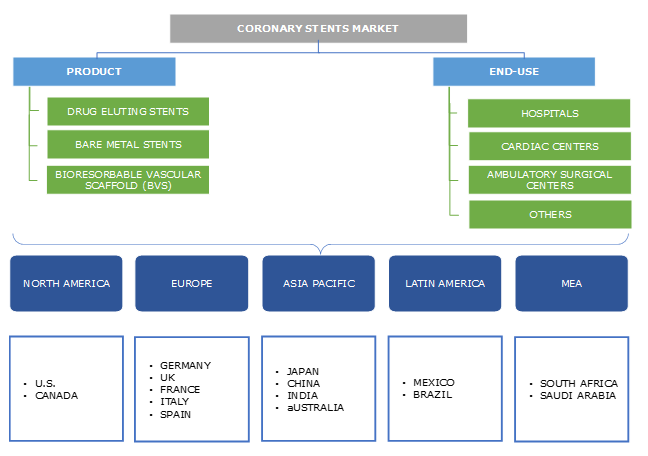 Coronary stents market is growing at immense pace in developed countries owing to various technological advancements and increasing burden of coronary artery disease. 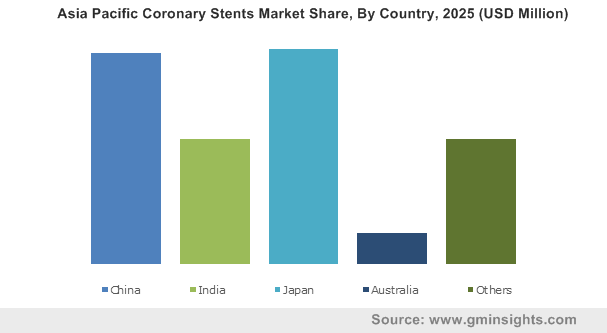 Coronary stents market will witness rapid growth in developing countries on account of changing government policies and increasing geriatric population. Demographic changes and adoption of sedentary lifestyle will result in high incidences of coronary artery diseases across the globe. Industry is witnessing large number of new entrants that are engaged in the development of advanced coronary stents with miniaturization to generate higher revenue. 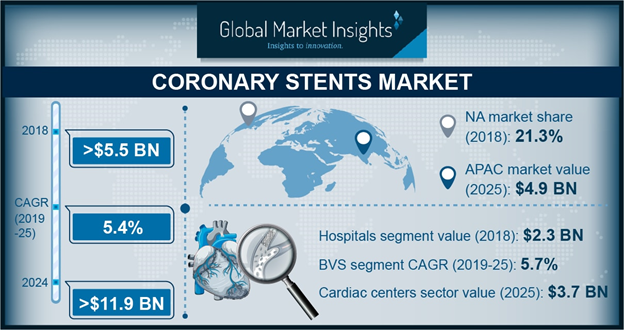 With advancements in existing technologies and rising demand of minimally invasive surgical procedures, coronary stents industry will offer promising growth opportunities in near future.